1. TRANSACTION FEES: The ever rising transaction fees of bitcoin is one of the many threats that threatens the crypto. Freebitco.in recently announced in its website that its transaction fee is 0.00003. Imagine sending 0.005 bitcoin and paying 0.00003 as the transaction fee. The increasing rise in bitcoin transaction fees is making crypto users consider using Altcoins and this no doubt pose a threat to the use of Bitcoin. 2. BIG FINANCIAL INSTITUTIONS: Bitcoin users and investors have tried to wave off the many attacks thrown at bitcoin by big financial institutions, but the truth still remains that these institutions have valid reasons to show concern over the use of Bitcoin. While bitcoin users might be making millions from it now, reverse might also be the case in the near future. These many negative comments from big financial institutions is also another threat that bitcoin has been dealing with. Read Also: Bitcoin: Opera Browser against Crptocurrency mining. 3. ANONYMOUS: All Bitcoin users and investors can decide to stay completely anonymous and true identity of such users/investors won’t be known. This means that bitcoin can be use for negative purposes and the perpetrators of these acts won’t be caught. Point been, as time goes on people who realists this may decide to stop using bitcoin. 4. 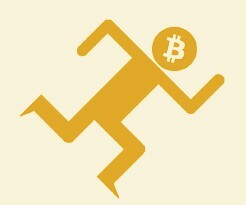 LOCAL CURRENCY: It is sure that bitcoin can’t displace the use of local currency. So do you think there might come a time when bitcoin will be totally forgotten? Well that is still uncertain but it is important to note that bitcoin has no real value, it’s the local currency that infact gives bitcoin value. The summary is that, investing in Bitcoin is like gambling the table might be in your favor. Infact as it stands now many people of made millions from bitcoin investment. If you wish to learn more about bitcoin investment please contact Mr Pablo Voice call +234 908 383 2420 or +234 811 774 5973 also available on WhatsApp. Next articleBITCOIN PRICE CRASH: The Bitter-Sweet Tale.